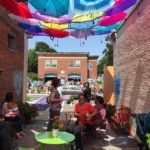 You may have been driving down Tyler Street this past weekend and noticed something very different: a whole block bustling with activity. That’s the point of Team Better Block. In just a few short months they worked with Mass Development’s Transformative Development Initiative (TDI) to re-imagine the block between the old Hess Station and Good Will Industries. Volunteers getting ready to knock on doors near Tyler St. 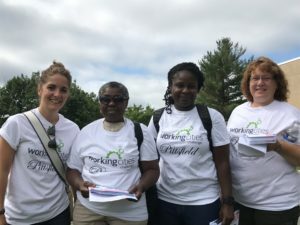 When Working Cities Pittsfield volunteers knocked on neighborhood doors to raise awareness of the project, they asked residents what their least favorite block on the street is. 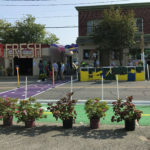 Nearly everyone we spoke with said the same thing, “that old Hess station.” Better Block gave them an opportunity to envision something different. 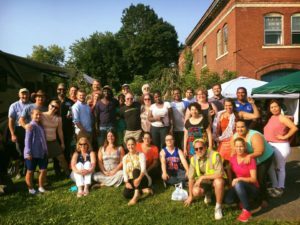 Beginning in June, Working Cities participated with dozens of volunteers to study the block and work with TDI and Team Better Block to create a plan that reflects the neighborhood and the needs expressed by residents. Once the plan was finalized, teams went into action to gain supplies and actually build out the design. 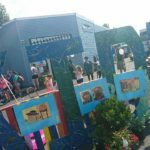 On August 26 they accomplished that goal and turned that block into a bustling neighborhood filled with families, music, and a whole new feeling of community. A view from the fire station shows bright cross walks and a bike track. 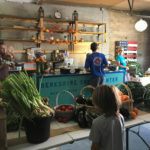 Residents visit the Berkshire Dream Center’s pop-up market. 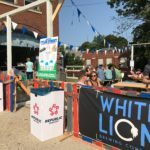 Visitors enjoy the pop-up Beer Garden sponsored by White Lion Brewery. 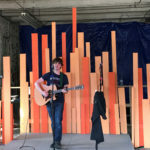 Local musician, Chad Tarvis takes the stage to entertain. Umbrella Alley, designed by Kate Louzon, was a huge hit for the day. 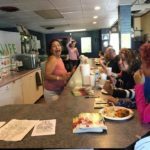 Manos Unidas and Hopeseed sponsored a Puerto Rican Cafe and art space. 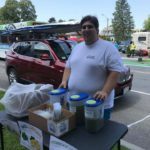 Zachari Durso selling his delicious lemonade. Some of the volunteers who made Better Block possible. We don’t plan to stop there either. 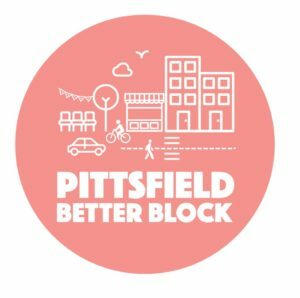 Working Cities Pittsfield will work with Mass Development, and the City of Pittsfield to take some of what we learned and continue to improve the Tyler Street corridor. If you’d like to be a part of it, contact us today! Did you miss the last Working Cities Wednesday? No problem. Here are some actions you can join in our community. 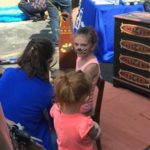 • Create a multigenerational project surrounding oral history of the Berkshires and painted chairs that can be placed in public areas. • What past efforts have been made to facilitate this goal? • Can signs around the park be added? • Should the speed limit be lowered? • How to make the experience of interacting with officials and candidates more culturally competent. • Explore how best to engage people in the small discussions. • What’s the best format?